At least this weekend was planned — the school district always does a four-day weekend for Presidents’ Day (unless they’re trying to make up for missed snow days). Usually, I like to spend this long weekend in Boston at Boskone, but this year, the convention is scheduled for next weekend, so that’s a non-starter. Currently, we have snow falling and it’s so cold outside that even the salt on the roads isn’t melting it. This is due to change within the next twelve hours, however, and the snow should be rain by morning — which means the kids will not have a delay. Yay! Honestly, though, they’ve been pretty good about letting me work. My son was designing something in Minecraft that he wanted me to look at, and my daughter wants someone to play with her on the couch, but I got done what I needed to do for the day. Can’t complain about that. In fact, since I did get done what I was aiming for, I think I will go play with the girl for a bit. 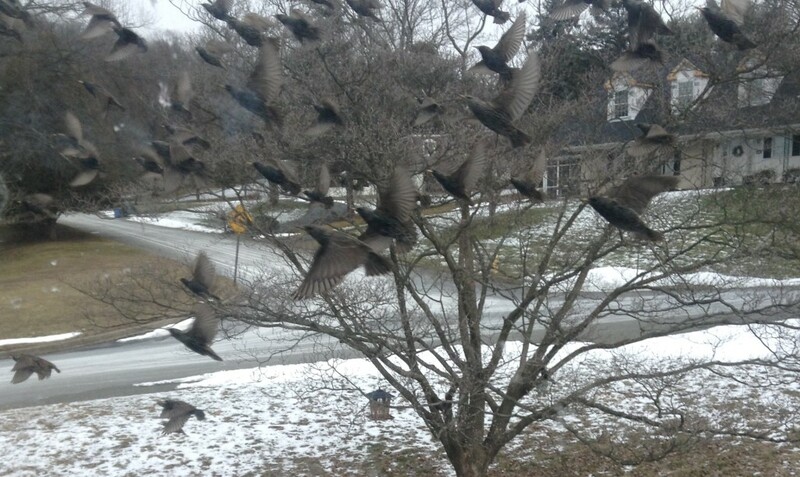 Before the snow fell, however, most of the ground was bare, and the starling flock that migrates through (both fall and spring) was visiting our front yard. I got a few pictures, including one lovely shot of them on the wing. Enjoy! Sounds like a nice weekend, though too bad about Boskone timing. Are you going to get to go for a short time next weekend? Very cool photo. I have a hard time photographing birds, especially when they’re on the fly. Thank you! I’m sure it was just lucky timing on my part, but I’ll take it.